The Great Recession, as harrowing as it was a decade ago, seems to have faded from public memory. It is safe to say that a general sense of normalcy pervades the lives of most Americans. Today, the economic environment could not be more optimistic: The U.S. stock market is hitting new highs, unemployment is at historically low levels and home prices have rebounded to their pre-crisis highs. Banking profits have roared back. Wharton finance professor Krista Schwarz agrees that the banking industry is “much safer than it was pre-crisis,” thanks to the financial reforms of the Dodd-Frank Wall Street Reform and Consumer Protection Act in the U.S. and Basel III, which is a set of voluntary international banking regulations requiring minimum capital requirements and leverage ratios, as well as enhanced risk capture, adequate liquidity, among other stipulations. “Leverage is down, reducing exposure, and banks have much larger liquidity cushions to protect against potential shocks,” she adds. Critically, Herring notes, “the authorities took the bold, but important, step of making the results public. This was a bold measure because in fact 11 of the 19 banks failed the stress test. Wharton finance professor Itay Goldstein concurs that the U.S. “did a better job stabilizing the financial system more quickly and more thoroughly than Europe. You can see that banks in Europe continued to have problems for a longer period, and the overall economic problems in Europe [stayed] longer and [were] deeper than in the U.S. I think to some extent this is still the case today. By and large the banking system here is in better shape than in Europe. Europe has some issues that are specific to them that they still have to deal with. Most of it is about coordination across the different countries in the EU.” One complexity: There are local central banks in European countries, and they have to coordinate their actions with the European Central Bank (ECB), he says. Herring points to another challenge. “The closely related problem is that the European Union is trying to run a monetary and banking union without a European fiscal policy,” he says. “Because European banking regulations do not address differences in country risk among European member states, European banks are often heavily exposed to member countries that encounter debt problems. Thus, in addition to the financial crisis, Europe has had to contend with a series of country debt crises.” At the time, Portugal, Italy, Ireland, Greece and Spain could not repay or refinance their government debts or bail out their own distressed banks without help from the ECB, International Monetary Fund (IMF) and more stable EU nations. Getting the financial crisis under control globally took a coordination of policies by the G20 governments, wrote IMF Managing Director Christine Lagarde in a recent blog. “Countries with banking problems limited the drag of flailing financial sectors on the real economy — through measures such as capital support, debt guarantees, and asset purchases. Central banks slashed policy rates and later sailed deep into unknown seas with unconventional monetary policy. Governments propped up demand with large fiscal stimuluses.” IMF did its part too, she said, putting $250 billion into the system. The financial crisis has cast a long shadow. Lagarde said 24 countries “fell victim” to banking crises, and economic activity has not rebounded for most of them. 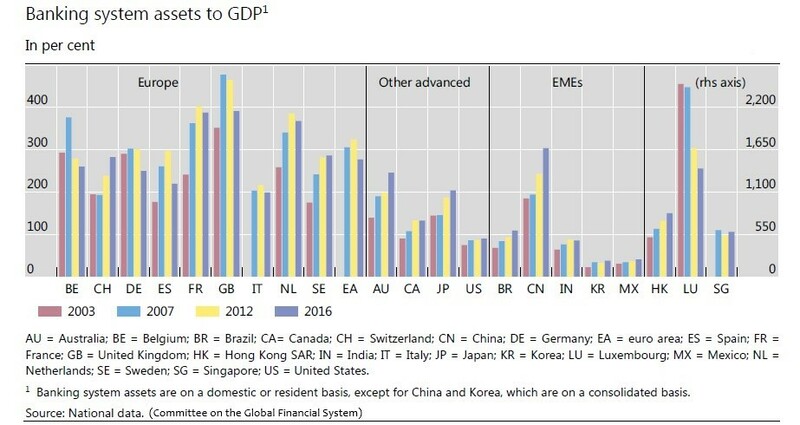 Public debt in advanced economies increased by more than 30 percentage points of GDP, which she attributed to economic weakness, efforts to stimulate the economy and for bailing out failing banks. In the U.S., the economy in 2017 was 12 percentage points smaller than it would have been if the 2007-2009 Great Recession had not happened, based on its pre-crisis growth trend, according to the Federal Reserve Bank of San Francisco. Such a substantial loss is “unlikely” to be recouped, the central banker said, translating to a lifetime present value income loss of $70,000 for every American. Indeed, the road back from the brink has been “long and slow,” said William Dudley, former president of the Federal Reserve Bank of New York, in a November 2017 speech in New York. Today, U.S. and European banks affected by the crisis have changed. They have been reassessing and adjusting business strategies, growth plans, balance sheet positions, cost bases, organizational structures, scope of activities and geographic presence, according to a January 2018 report by the Committee on the Global Financial System (CFGS), a central bank forum that monitors global financial markets for stability and other issues. In general, banks have moved away from holding “complex or capital-intensive assets” towards assets that typically pose less risk, the report said. Moreover, “many large banks have reduced their exposure to trading assets and more complex securities.” Another trend among big banks is that they have decreased activities in over-the-counter derivatives due to new regulations. This is particularly apparent in global, systemically important banks, according to the CFGS. In the meantime, their common equity capital ratios have risen “significantly” since the crisis. Banking systems that are members of the CFGS also saw annual average growth fall to 4% from 2008 and onwards, compared to about 12% from 2003 to 2007, right before the crisis. In Europe, the ratio of bank assets to GDP was a mixed bag, plunging in some and rising in others. Banks in emerging markets have not been as impacted by the crisis and continued to show robust growth, the report said. In particular, growth of the Chinese banking system jumped to around 310% of GDP from 230% between 2010 and 2016. It is now the largest in the world. Two European banks that saw significant changes were the Royal Bank of Scotland (RBS) and Switzerland’s UBS. The report said that RBS failed in October 2008 and had to be rescued by the U.K. government. Since then, the bank has taken steps to strengthen its balance sheet. It decided to focus on lending to U.K. businesses and households while shrinking its investment banking activities. RBS also reduced its global operations down to 13 countries from 38. The bank is expected to continue in a period of major restructuring through 2019. The Swiss government rescued UBS in 2008. Since then, the bank has moved away from investment banking activities and refocused on its other businesses, in particular global wealth management and retail and corporate banking in Switzerland. UBS also said its investment bank operations would exit a “substantial” number of fixed income business lines, in particular complex and capital-intensive credit and interest rate products, according to the CFGS report. As American and European banks regrouped after the crisis, financial institutions in emerging market economies continued to grow. 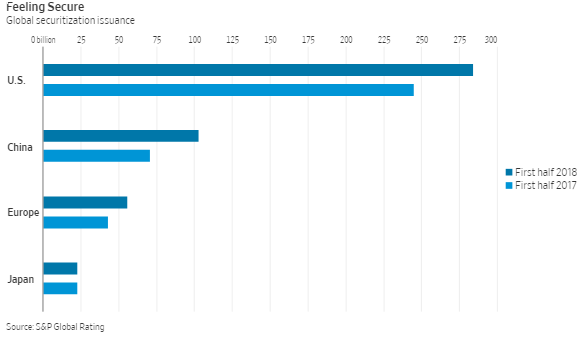 Chinese banks, in particular, rose to the top of the banking hierarchy with their massive assets. But they also took on a lot of debt. Goldstein says there is “potential fragility” building up in China. “Credit is growing, banks are growing, and those are known to be leading indicators of future declines and future crises. [It’s] possible things are going to start there.” But since China is centrally controlled, the outcome could differ from what happened in the U.S. and Europe, he adds. Another area to watch is financial innovation, which brings risks along with benefits. It is a “double-edged sword,” Schwarz says. “New products can increase the efficiencies of capital markets, but they can also present new risks.” That’s especially true because technology typically innovates too fast for regulations to catch up. But one silver lining is that technology brings about much improved financial data collection and transparency, which helps alert policy makers and investors about potential risks, she adds. But, there are still risks, mostly outside of the heavily regulated banking system. Schwarz believes that money market mutual fund reform is incomplete. Also, she says, the “skin in the game” rules for securitizations exempt most mortgages. While post-crisis reforms have made the banking system safer, Herring adds, “to some extent, they have simply shifted risk to other institutions and markets that are less carefully monitored and largely unregulated with regard to safety and soundness.” Risk is like the air in a balloon. By squeezing one part of the balloon, the pressure goes to another part of it. “If that part of the balloon is weaker, it may cause the balloon to explode,” he says. Meanwhile, the U.S. government’s attempt to enhance oversight of the non-bank financial system through the Financial Stability Oversight Council has “fallen short of the kind of surveillance we should have in place to anticipate emerging sources of risk,” Herring notes. It’s been 17 years since the al-Qaida terrorist attacks that brought down the World Trade Center, and the U.S. has been at war ever since – with Afghanistan, with the Taliban, with al-Qaida, with terrorism, with the “axis of evil,” with Iraq, with the Islamic State. The events of that day revealed a great deal about America, but 17 years later, many of those revelations have been forgotten or were never realized. The most important that remains is that al-Qaida knew the U.S. better than the U.S. knew itself. Thousands died in New York, Virginia and Pennsylvania on 9/11, and in a combination of grief, rage, vengeance and self-centeredness, the U.S. reacted as though the attacks were an end in themselves. The response was exactly what the terrorists had hoped it would be. They knew the U.S. would barge into the Muslim world with guns blazing to punish those who had dared attack it, who had shattered the post-Cold War dream of having achieved a more peaceful global order. Most of all, al-Qaida knew it could use the U.S. reaction in a much larger conflict: an Islamic civil war that has been raging across an 8,000-mile front for decades, and to which there is no end in sight. It is hard to say exactly when the Islamic civil war started since Islam has been in a state of civil war since the first century of its existence. (Islam is hardly unique in this respect. Chapter 20 of the Book of Judges includes an account of the Israelites butchering their own tribes, and Christianity was at war with itself in Europe in the 16th and 17th centuries.) In A.D. 656, there was war over the proper accession to power after Muhammad’s death. Those disagreements would, by 680, lead to the split between Sunni and Shiite Islam, a rivalry as violent and visceral today as at any point in history. But the Islamic civil war that rages today is separate from the medieval rivalries over caliphal succession, or any of the myriad intra-Muslim wars over the centuries, though it is informed by this history, and the forms used today often mimic the past. The Islamic civil war in which the World Trade Center became collateral damage began in the 1970s between Muslims who believed that religion should dictate political life and Muslims who believed that emulating the political forms of the West and separating mosque and state is more desirable. It began, in other words, as a battle between religion and secularism. This was a friction within Islam that had long existed – many of the groups that would inspire or lead directly to the creation of al-Qaida and other radical Islamist organizations were formed decades before the 1970s. (The best known, the Muslim Brotherhood, was created in Egypt in 1928.) But these groups had previously sat on the fringes of society. The turning point was when Muslim countries, especially in the Middle East, began throwing off the yoke of colonialism and turning to secularism and nationalism. Some became socialist, some more capitalist, but they all shared a common state-run approach to economic affairs. The new, secular nation-states were still Muslim, but in the same way that the U.S. is a Christian country – Christmas is a holiday, but the rule of law is protected by constitutional legitimacy, not biblical fiat. In the Muslim world, however, constitutional legitimacy left something to be desired. Secularism reigned, but so did authoritarianism, and it’s hard to imagine it could have been any other way, considering how poor, fractured and weak the young post-colonial states were. Strongmen, often but not always from military backgrounds, dominated political life. And while women were wearing bikinis in Cairo, and Beirut became the Paris of the Middle East, these authoritarian regimes failed to live up to the promises they had made to their people, and the conservative elements of society seethed. As economies struggled, as regimes got more repressive to cement their control, and as Israel continued not just to exist but to embarrass Muslim attempts to destroy it, the Quran became that missing ingredient. And suddenly the Islamist political movements that had existed on the fringe began to play a more substantive role in politics. In 1979, the Iranian Islamic Revolution brought a strange amalgamation of Shiite theocracy and democratic republicanism to power. This was the same year the mujahedeen began fighting the Soviets in Afghanistan, eventually with U.S. support. Two years later, Islamists gunned down Egyptian President Anwar Sadat. At the time, the West was oblivious to what was happening. Most U.S. analysis after Sadat’s assassination accused Libya of having masterminded the attack; the idea that Islamist extremists were responsible was hardly on anyone’s mind. Radicalization moved at different paces in different countries, but in almost every Muslim country (or even every country that had a sizable Muslim population), it was clear something was in the water. For instance, in Turkey, whose post-Ottoman incarnation had been explicitly secular and where the military often intervened to remove the slightest hint of religious politics, there was a slow rise of more Islamic-minded elites as the more traditional Anatolian hinterland began to enjoy economic success and move to the cities. In 1995, the pro-Islamist Welfare Party became the largest bloc in parliamentary elections before the military stepped in. This is where the current ruling Justice and Development Party, or AKP, came from, and it was this struggle that was at the heart of the attempted coup in 2016. Even where Islamism did not win outright, it began changing political conversations. In 1990, the East Turkestan Islamic Movement became active in China, initiating China’s crackdown on its Uighur Muslim population that today has reached dystopian levels of surveillance and concentration camps. Hamas, an offshoot of the Muslim Brotherhood and de facto ruler today in the Gaza Strip, emerged in 1987 with Israeli support. (Israel hoped to create a counterweight to the secular Palestine Liberation Organization and got more than it bargained for.) In the Balkan Wars and genocides of the 1990s, the Muslim identity of groups in the former Yugoslavia played a major role. The Indonesian military dictator Suharto tried to get ahead of dissatisfaction with his rule by courting Islamist elements that had grown in influence in the country, and in 1991 he took a highly publicized hajj pilgrimage and began advocating Islamic values and promoting Islamist generals in the Indonesian military. The U.S., of course, famously played its own role in the proliferation of Islamism by supporting the endeavors of its Cold War allies Saudi Arabia and Pakistan. It was a classic case of the ends justifying the means, but it was followed by an unexpected development: the means pursuing their own ends. For example, America trained and armed the mujahedeen to fight the Soviets, only to see those weapons turned against the U.S. by al-Qaida after the Soviet collapse. For Washington, the war in Afghanistan was between liberalism and communism – Islamism was underestimated, considered just another tool to defeat or contain the Soviet Union. The United States failed to understand that the very groups it was helping detested the U.S., both for its values and especially for propping up secular, authoritarian dictatorships across the Muslim world. The Saudis and Pakistanis, meanwhile, failed to understand the limits of their control over the religious zealots they had empowered. Al-Qaida finally succeeded in its goal on 9/11. The deadliness of its attacks sparked a reaction in the U.S. that has yet to run its course. The U.S. began by invading Afghanistan, but within a few years, neoconservativism had justified extraordinary mission creep. The mission to defeat al-Qaida became a mission to make Afghanistan a liberal democracy. That mission was then grafted onto Iraq, where, in an example of American ignorance, it was claimed that Saddam Hussein’s regime had had ties to al-Qaida. Saddam was a murderer, but he was no friend of Islamist extremists. He knew that Iraq would be a fertile recruiting ground for jihadists if they ever established themselves in the country. The group that became the Islamic State flocked to Iraq to build its caliphate after the U.S. invasion, not before. But no matter what the U.S. did, it could never seem to win the day. Al-Qaida splintered into smaller groups – it has franchises all over the world now. The U.S., along with Saudi Arabia and the United Arab Emirates, has even reportedly cut deals with al-Qaida in the Arabian Peninsula so the Saudis can focus on defeating the Houthis in Yemen – an Iran-backed, Shiite sect that historically has been more concerned with creating an independent state in Yemen than with global jihad. The Islamic State emerged from radicals who went too far even for al-Qaida, and spawned a caliphate and franchises of its own around the world, from the Philippines to Nigeria. In some of these places, the U.S. is deeply involved, like in Yemen, where U.S. special operations forces help Saudi forces on the ground and where the U.S. makes the weapons that the Saudis drop. In others, like Nigeria, U.S. involvement is negligible because even a global superpower cannot be everywhere at once. What all this points to is the fundamental misunderstanding the United States has suffered from the moment it was attacked 17 years ago. 9/11 wasn’t the first attack on the U.S., nor was it primarily aimed at destroying the United States. It was simply the event that so galvanized the American people that it moved the U.S. government to action, any action, to make people feel a little bit better about the tragic loss of life that day. Some of that action, such as attempting to rebuild countries like Afghanistan and Iraq, came with noble intentions if impossible goals. Other action, like the United States’ involvement in Yemen, is little more than mission creep gone wild. An initially ill-defined goal has dragged the U.S. into conflicts with relatively little strategic import, and into compromises with the very group that attacked the U.S. on 9/11 in the first place. The Islamic civil war will continue, and there’s little the U.S. can do about it. That powerlessness was one of the things that made 9/11 so traumatic. That also happens to be what makes terrorism such an effective tactic – the way it manipulates fear and insecurity to warp the actions of its target rather than defeating its target outright on the battlefield. The radical Islamists wielded it particularly well against the United States. The U.S. has been at war for nearly two decades, but there is no battlefield on which the United States can guarantee surrender as it did with Japan, nor a single enemy whose defeat will bring an end to the war. There are, instead, 1.8 billion Muslims in the world trying to figure out what the relationship should be between religion and politics. The U.S. can articulate a position and support those fighting for that vision with either money or military force, but to do that, the U.S. has to realize what the war is about and why it is fighting in the first place, and prioritize its resources accordingly. In a very different time, about a very different war, and with an overtly political agenda, many in the U.S. once asked, “When will they ever learn?” Perhaps a better question would be, “Will they ever learn?” The Islamists think not – and they have staked their entire strategy on it. I confess I don’t know the answer, but I think it’s fair to say that after 17 years, it is above politics or naivete to ask. What Happened To Treasurys On Wednesday? - On Wednesday, bonds were routed and the selloff was the talk of the financial universe. - 30-year and 10-year yields hit their highest levels since 2014 and 2011, respectively. - Understanding why is critical, as is appreciating the extent to which Friday's jobs report just became even more critical than it already was. - Here's everything you need to know. A couple of weeks back, I wrote something for this platform called "The Bond Selloff That Nobody Noticed". That was a recap of events that transpired during the week of September 17, when yields rose on what looked like a combination of rising inflation expectations and the term premium trade. One of the oddities of that week was the dollar (NYSEARCA:UUP), which did not rise in tandem with U.S. yields. Instead, the greenback fell as commodities rallied, a combination that helped buoy sentiment in downtrodden ex-U.S. assets, particularly emerging markets, where equities outperformed their U.S. counterparts handily and currencies logged their best week since February. Fast forward to Wednesday and Treasurys sold off hard. This time around, the financial media definitely took note. Wednesday's bond rout was the talk of the financial universe as 30-year and 10-year yields hit their highest levels since 2014 and 2011, respectively. The selloff began in earnest with a big ADP beat and gathered steam following an extremely hot ISM services print. What should you make of all this? But more importantly for average investors, this feels a whole lot like late January/early February. We're staring down an acute selloff in bonds that so far has been accompanied by rising stock prices (SPY) and we're headed into a pivotal jobs report on Friday. In the interest of brevity, I won't recount the whole story here, but do recall that on January 29, I published a post on this platform called "Hey Guys? The Bond Selloff Needs To Stop, Like Right Now". The gist of that piece was that bond yields were rising too far, too fast, and I suggested it was just a matter of time before the stock-bond return correlation flipped positive, leading to a selloff in both equities and bonds at the same time. Five days later, wage growth came in ahead of expectations and the bottom fell out, as the bond selloff that had been gathering steam for weeks collided with the first real evidence that inflation pressures were starting to build in the U.S. economy. January was defined by rising yields and a melt-up in U.S. stocks. Incoming Fed Chair Jerome Powell was expected to adopt a more data-dependent approach to monetary policy than his predecessor, and that had markets on edge about inflation. That is very similar to the current setup. 10-year yields have risen more than 30bps since September 1. Meanwhile, U.S. equities have made new high after new high since August, when the S&P finally recouped losses incurred in February and March. I do not see it as likely that the Phillips curve is dead, or that it will soon exact revenge. You can read the full text of his speech in that linked post, but suffice to say he is playing down the possibility that at some point in this late-stage expansion, wage growth is going to take off and catch the Fed woefully behind the curve. I continue to believe that the market’s skepticism on “higher inflation” to be a mis-priced risk that could further escalate the Rates selloff in unruly fashion, especially with the 1) “wage growth” story picking-up further yesterday (Amazon minimum wage hike), 2) four year highs in Crude, 3) the cycle-lows in U-Rate / another large “Labor” beat with ADPs today 4) cycle-highs in Consumer Confidence, 5) 17 year highs in JOLTS Quit Rate…all into the “real-time” escalation of the “QE to QT impulse” broad “bearish fixed-income” catalyst. That is a characteristically incisive assessment from Charlie. Again, do note that all of the above raises the stakes for Friday's September jobs report. Nomura reinforced that in a note out Wednesday the gist of which was that payrolls may have an outsized impact given the Fed's data-dependent lean. 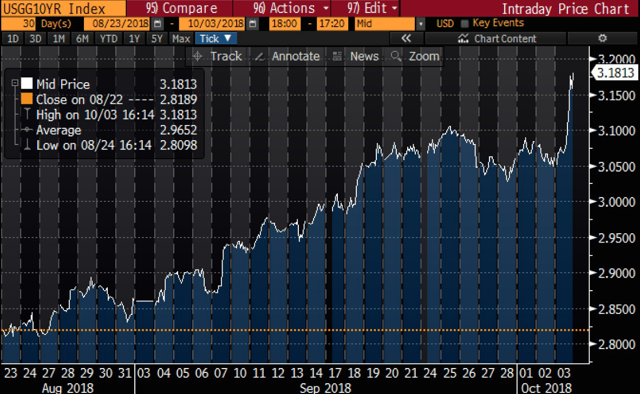 The most critical thing to understand about Wednesday is that the market’s interpretation of rising yields can turn on a dime, and this has all the trappings of an inflation scare. When it comes to rate rise, it’s the “why?” and the “how quickly?” that matter and while the answer to the first question bodes well for risk, we might soon be answering the second question with this: “Too fast”. That is precisely what happened in February. Yields had been rising for quite a while, but stocks took it in stride as the bond selloff was generally seen as a reflection of U.S. economic strength. Finally, there was a tipping point and inflation worries took over. 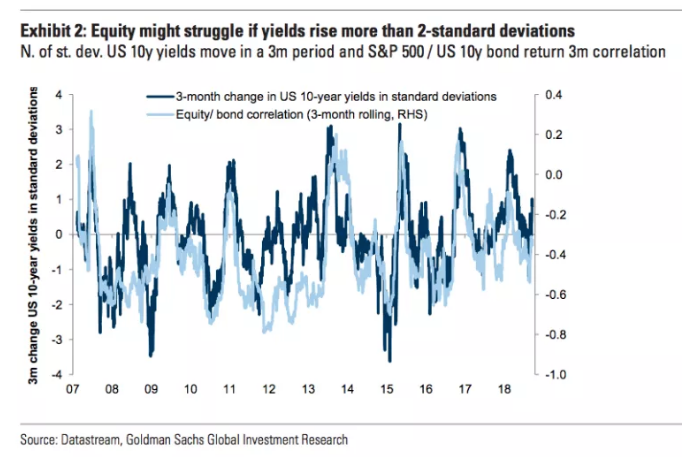 Goldman was out a couple of weeks back reiterating the very same warning they delivered in and around the February selloff - namely that if yields rise by more than two standard deviations in a 3-month period, the 3-month stock-bond return correlation tends to flip positive or, more simply, stocks begin to selloff with bonds. That's the dreaded "diversification desperation" and it plays havoc with balanced portfolios and risk parity. Not to put too fine a point on it, but we're due for drawdown there. In fact, the current bull market in balanced equity/bond portfolios is the longest in history. While not our base case, with high and rising inflation, like the 70s and 80s, equity/bond correlations turn positive - from US CPI levels above 2% over a 3-year rolling period there have been many instances when equity/bond correlations turned positive (Exhibit 35). 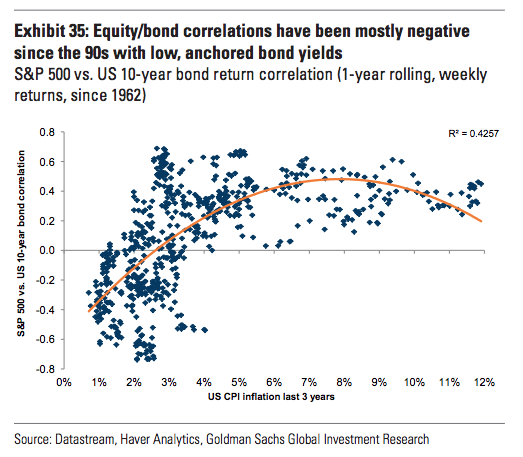 Also, the relationship does not appear to be linear - when positive inflation surprises become a bigger worry than negative ones, bonds are unlikely to be good diversifiers for equities and higher yields can weigh on equities. 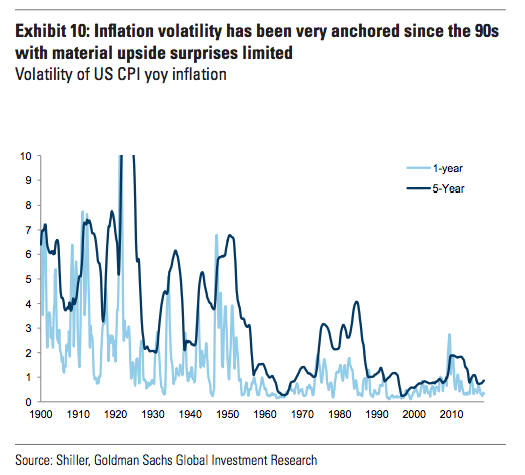 US inflation risk might be higher than investors think. There is always risk of a fast pick of inflation and upward pressure on rates when moving late cycle, especially with US fiscal stimulus and the introduction of trade tariffs. Our economists highlighted capacity constraints and the risk of overheating of the labour market - the current policy backdrop is similar to the runup to the late 60s inflation shock. You should also be acutely aware of the fact that real yields are to a certain extent a function of inflation expectations given the data-dependent Fed. 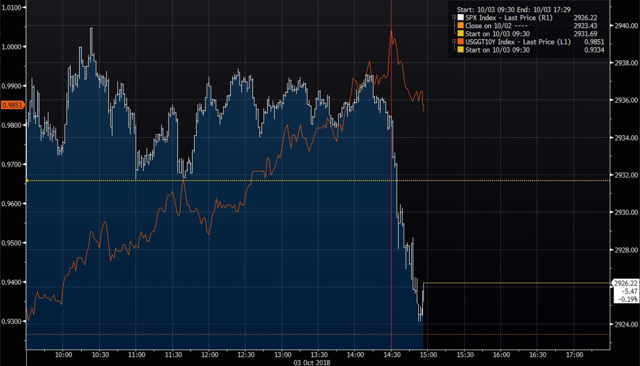 The more inflation pressure, the more inclined the market believes the Powell Fed will be to respond. A hawkish response pushes real rates higher. The bond market is flashing us a buy signal. But not in the way you think. This signal isn’t telling us to buy bonds. This isn’t the sort of essay I typically write. It doesn’t focus on special, speculative opportunities like the legal marijuana market, cryptocurrencies, sports betting, or electric vehicles. This essay’s all about the broad market. And I wrote it because most investors have the bulk of their wealth in index funds right now. You’re looking at the yield on the 10-year U.S. Treasury going back to the 1980s. You can see the 10-year yield has been falling for decades. That’s because we’ve been in a bond bull market for the last 37 years. And bond yields move inversely to bond prices. They fall when bond prices rise. The yield on the 10-year Treasury jumped above 3%. 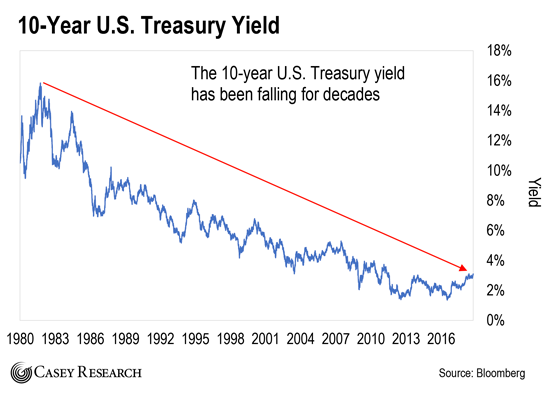 In the process, it pierced a nearly four-decade-long downtrend in yields. This reflects a major change in sentiment towards bonds. Specifically, it suggests that the 10-year Treasury will keep climbing. Gundlach, as you may know, is a world-class investor. Gundlach also has a knack for nailing big calls. For example, he predicted the bottom in Treasury yields back in July 2016. And that call has been absolutely spot on. Just look at the chart below. 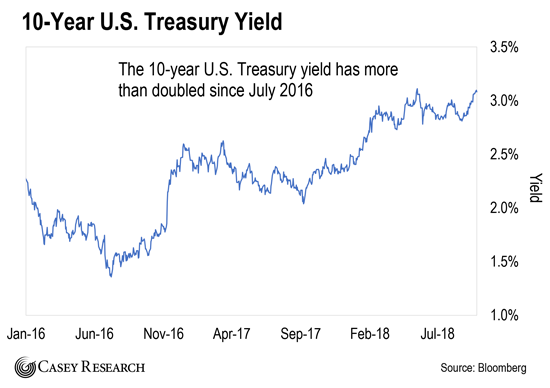 You can see that the 10-year Treasury yield has more than doubled since July 2016. That’s an enormous move. But a big sell-off in Treasuries would also be bullish for stocks. I say this because Treasuries are widely regarded as a safe haven. Investors take shelter in them when they’re nervous about the economy or stock market. When investors are optimistic about the economy and stocks, they do the opposite. They get out of Treasuries and into riskier assets like stocks. And right now, this market is telling us that there’s more demand for riskier assets than safety. Of course, that’s not the only reason I say this. Just look at the chart below. It compares the performance of the iShares iBoxx $ High Yield Corporate Bond ETF (HYG) with the iShares 20+ Year Treasury Bond ETF (TLT). HYG invests in high-yield corporate bonds, or what most people call “junk bonds.” TLT, on the other hand, holds long-dated Treasuries. When this ratio (line) is falling, TLT is outperforming HYG. When it’s rising, the opposite is happening. HYG is outperforming TLT. You can see that this line has been inching higher all year. Not only that, HYG just broke out relative to TLT. This tells us that investors haven’t given up on bonds entirely. Instead, they’re favoring junk bonds, which have a similar risk profile to stocks. In closing, the recent weakness in Treasuries isn’t a reason to panic. But it is a reason to stay long U.S. stocks… at least in the near term. You may also want to use down days as opportunities to add to your favorite holdings. China is celebrating the 10th anniversary of the global financial crisis with a securitization party. Products that became a symbol of Wall Street’s unsustainable excesses a decade ago—such as mortgage-backed securities—are surging in popularity with Chinese investors. Just over $100 billion worth of asset-backed securities were issued in the first half of 2018 in China, according to S&P Global Ratings, a 44% year-over-year rise that put the country second, after the U.S., in terms of world-wide issuance. Enough differences exist between the U.S. in 2008 and China now to suggest this won’t be the corner of markets that brings the global financial system to breaking point. That doesn’t mean there’s no cause for concern. The growth of asset-backed securities is one consequence of broader trends in Chinese banking. Regulators have focused over the past year on forcing banks to take things back onto their balance sheets, such as wealth-management products they sold to customers. Securitization is a legitimate way for them to reverse that trend by hiving off assets—creating room to make still more loans. Nearly $30 billion of mortgage-backed securities were issued in the first half, more than in all of 2017, almost all by major banks such as China Construction Bank, the nation’s biggest home lender. So far, the surge has come with few alarms. The default rate of mortgages included in most securities remained below 0.75% as of the end of June, S&P says. The vast majority of securitized home loans have been made to borrowers with clean credit histories, the ratings firm says. Pressure points appear to lie elsewhere. Issuance of auto-loan-backed securities plummeted in the second quarter, a corollary of slowing Chinese car sales. And regulation remains an unpredictable variable: Witness the slump in securities issued by consumer-finance companies after Beijing suddenly tightened standards earlier this year. Of most concern may be the emergence of securities linked to Chinese property developers. Small suppliers have been able to offload receivables from the likes of China Vanke and Country Garden at a discount to third-party factors, who securitize them and sell them to investors. The arrangement suits the suppliers, who get paid earlier, and developers, who get to pay their debts later. The risk, of course, is that highly indebted property companies don’t ultimately pay up. If a Chinese housing downturn ever materializes, it’s here that pain in its securitization market could first be felt. BERKELEY – While the mania for cryptocurrencies may have peaked, new units continue to be announced, seemingly by the day. 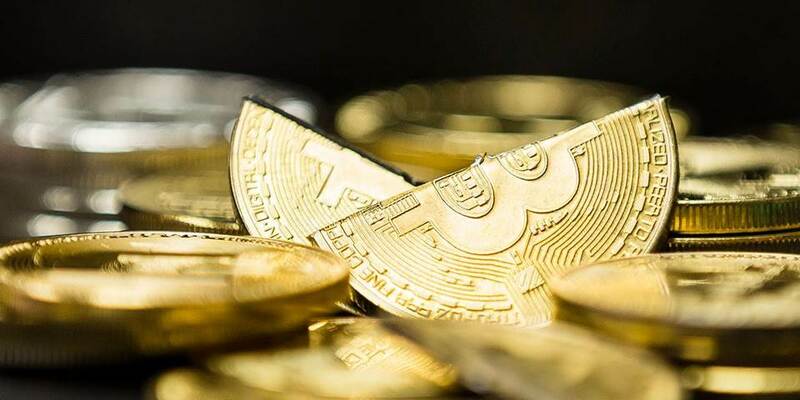 Prominent among the new arrivals are so-called “stable coins.” Bearing names like Tether, Basis, and Sagacoin, their value is rigidly tied to the dollar, the euro, or a basket of national currencies. It’s easy to see the appeal of these units. Viable monies provide a reliable means of payment, unit of account, and store of value. But conventional cryptocurrencies, such as Bitcoin, trade at wildly fluctuating prices, which means that their purchasing power – their command over goods and services – is highly unstable. Hence they are unattractive as units of account. No grocer in his right mind would price the goods on his shelves in Bitcoin. No worker would want a long-term employment contract that paid her a fixed number of those units. Stable coins purport to solve these problems. Because their value is stable in terms of dollars or their equivalent, they are attractive as units of account and stores of value. They are not mere vehicles for financial speculation. But this doesn’t mean that they are viable. To understand why, it is useful to distinguish three types of stable coin. The first type is fully collateralized: the operator holds reserves equaling or exceeding the value of the coins in circulation. Tether, which is pegged one-to-one to the dollar, claims to hold dollar deposits equal to the value of its circulation. But the veracity of this claim has been disputed. This points to yet another problem with this model: expense. To issue one dollar’s worth of Tether to you or me, the platform must attract one dollar of investment capital from you or me, and place it in a dollar bank account. One of us then will have traded a perfectly liquid dollar, supported by the full faith and credit of the US government, for a cryptocurrency with questionable backing that is awkward to use. This exchange may be attractive to money launderers and tax evaders, but not to others. In other words, it is not obvious that the model will scale, or that governments will let it. The second type of stable coin is partly collateralized. In this case, the platform holds dollars equal to, say 50%, of the value of the coins in circulation. The problem with this variant will be familiar to any monetary policymaker whose central bank has sought to peg an exchange rate while holding reserves that are only a fraction of its liabilities. If some coin owners harbor doubts about the durability of the peg, they will sell their holdings. The platform will have to purchase them using its dollar reserves to keep their price from falling. But, because the stock of dollar reserves is limited, other investors will scramble to get out before the cupboard is bare. The result will be the equivalent of a bank run, leading to the collapse of the peg. The third type of stable coin, which is uncollateralized, has this problem in spades. Here the platform issues not just crypto-coins but also crypto-bonds. If the price of the coins begins to fall, the platform buys them back, in exchange for additional bonds. The bonds are supposed to appeal to investors because they trade at a discount – so that, in principle, their price can rise – and because the issuer promises to pay interest to the bondholders, in the form of additional coins. That interest is to be funded out of the income earned from future coin issuance. Here, too, the flaw in the model will be obvious to even a novice central banker. The issuer’s ability to service the bonds depends on the growth of the platform, which is not guaranteed. If the outcome becomes less certain, the price of the bonds will fall. More bonds will then have to be issued to prevent a given fall in the value of the coin, making it even harder to meet interest obligations. Under plausible circumstances, there may be no price, however low, that attracts willing buyers of additional bonds. Again, the result will be collapse of the peg. All of this will be familiar to anyone who has encountered even a single study of speculative attacks on pegged exchange rates, or to anyone who has had a coffee with an emerging-market central banker. But this doesn’t mean that it is familiar to the wet-behind-the-ears software engineers touting stable coins. And it doesn’t mean that the flaws in their currently fashionable schemes will be familiar to investors.